Nagavara Ramarao Narayanamurthy is an industrialist and a software expert in the field of Information Technology. He is also the co-founder of Infosys Technologies, which is a worldwide consulting and I.T. Services firm of India. 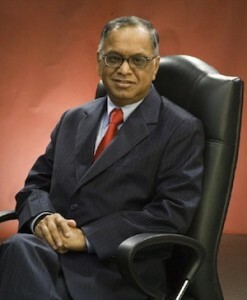 Narayanamurthy was born on Aug 20,1946 at Karnataka. Presently, he is the non-executive chairman and main mentor of Infosys. He holded the post of CEO for a period of 21 years. He received Padma Vibhushan, which is the nation’s second highest civilian award. He earned a degree in Electrical Engineering from the National Institute Of Engineering, Mysore University. Afterwards, he earned his master’s from IIT Kanpur. He was a chief systems programmer at IIM Ahmedabad. Later on, he joined Patni Computer Systems in Pune. There, he met his future wife Ms. Sudha. vehicle nor landline. Mr. Murthy revealed that it was not the comforts of life but it was the love to create new things motivated him to move forward. The firm did not perform well in initial stages. Mr. Murthy and other founders of the company wanted to make their presence felt in the foreign market. So they partnered with Kurt Salmon Associates, but the partnership ended in the year 1989. This sudden collapse threatened the company to shut down. But Mr. Murthy was hopeful that their company will be successful some day. Mr. Murthy’s able leadership made the firm successful later on. The company’s income started increasing and reached more than 290 million. Also, the company’s earnings from foreign lands was in the range of 50 to 90 crores. It was Mr. Murthy’s sincere efforts that earned Infosys a respectable position not only in India but also abroad. And now, he is among the top 12 successful entrepreneurs of the world. Next articleSteve Jobs – The Man Who Moulded Apple Inc.